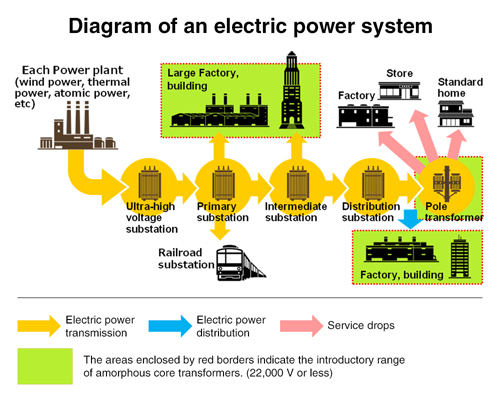 Transformers convert high-voltage electricity supplied from a power station into lower-voltage electricity for safe use. They operate every day of our lives and are used extensively. Transformers are in heavy use for many hours over long periods of time, thus the reduction of the loss resulting from power conversion per transformer will have a large energy-saving effect. Hitachi has reduced no-load losses (standby electricity) using a transformer that employs amorphous alloy. Energy savings have been achieved in public facilities and tall buildings where electricity usage fluctuates and in photovoltaic systems with a low actual operation rate, as well as in factories and buildings. 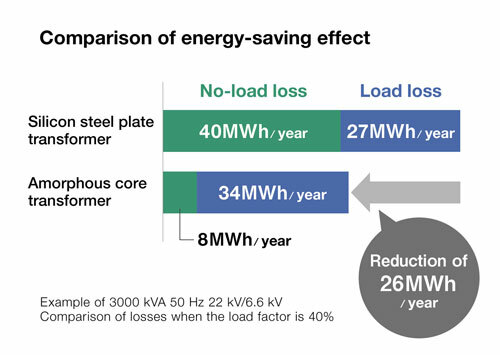 No-load losses (standby electricity) have been reduced to about one-fifth by using amorphous alloy with superior electrical characteristics for the iron core where electricity-conducting windings are coiled. A recycling system is established so that amorphous iron cores of used transformers collected from customers can be recycled to amorphous alloy and used as recycling material*1.